Wayne Barton holds two day and week long classes at many locations in the US and Canada. In addition to teaching classes, Wayne also attends, judges, and lectures at several shows each year. View our schedule of upcoming classes and shows. We would be delighted to have you participate by attending any of the events. 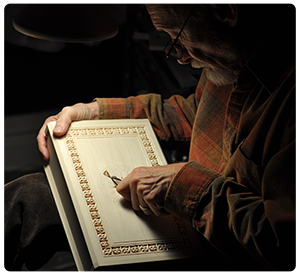 Beginning Classes are designed for those who have little or no carving experience. These classes concentrate on how to properly sharpen tools, the basic techniques of chip carving, and executing essential patterns and designs, with emphasis on how to create borders, grids, rosettes, lettering, and free form ideas. 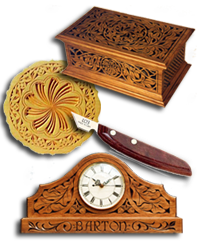 Intermediate/Advanced Classes are for those who have a working knowledge of chip carving. This class is dedicated to design and application. Here we learn the various aspects of design, including balance, contrast, and proportion. Students are encouraged in creating their own designs with assistance in executing the finished work.